What size house sign do I need, small, medium or large? We get asked a lot by customers which size house sign they should choose in order for their house name or number to be easily seen and read from the road. We usually recommend that you choose the largest sign that will fit on the area it is to be located. That doesn't mean we recommend a large sign with plain car number plate style lettering as we offer over 20 different letter styles (fonts) which will determine in part the size of base plaque needs to be used for the location. Lets say you want a small sign to fit on your front gate which is close to the road, our 250mm by 60mm base plaque is ideal. If you want the sign fitted on the house and it is more than 3 car lengths from the road we would recommend you choose our 500mm by 125mm size slate plaque. For instance Iet's suppose a customer wants the house name 'The Willows' engraved on a slate sign in Century Schoolbook font in ALL CAPITAL LETTERS. We adjust the size of the letters to fit within the width of the sign. 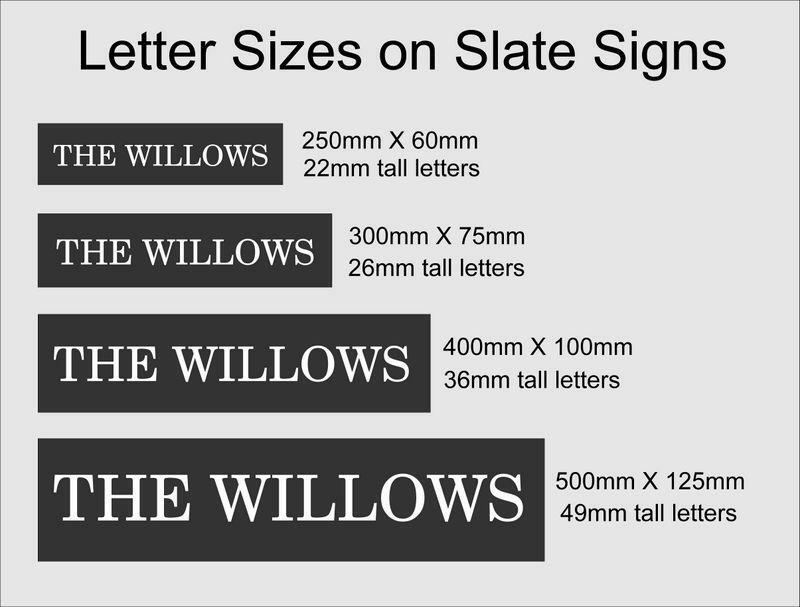 This means if he chooses our smallest sign the house name would be 22 mm tall or on our largest sign the text would be 49mm tall as shown in the illustration below. Most people also ask for the text to be in large capital letters but this can be more difficult to read from a distance compared with capital and lower case lettering on longer house names. Take a look at the illustration below. 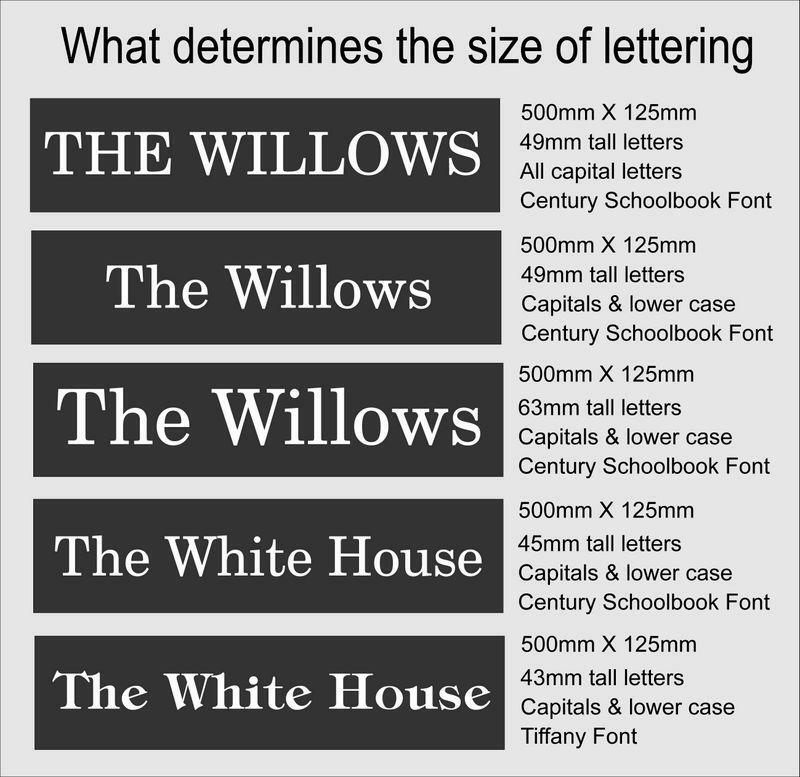 As you can see the height of the letters on any particular house sign is determined by the amount of letters and spaces in the house name plus the font style (whether it is fat or thin) and also if the name is in all capital letters or capitals and lower case. To get the wording larger than 43mm on the bottom sign in the illustration above 'The White House' we could split the name into two or even three lines of text on a deeper sign In 3 lines of text. The Capital letter height would work out at 60mm to fit within a sign measuring 500mm by 300mm which is the largest house sign we make. We always design the text and numbers to fit within the dimensions of the base plaque and send a scaled mock-up proof for customer approval before we go ahead and make the sign.